The Solomon R. Guggenheim Museum presents Tales of Our Time, an exhibition featuring eight newly commissioned, large-scale works by artists born in mainland China, Hong Kong, or Taiwan. This is the second exhibition of The Robert H. N. Ho Family Foundation Chinese Art Initiative, a long-term research, curatorial, and collections-building program at the Guggenheim Museum. Though diverse in subjects and strategies, the works are united by the artists’ use of storytelling to propose alternative ways of looking at place. 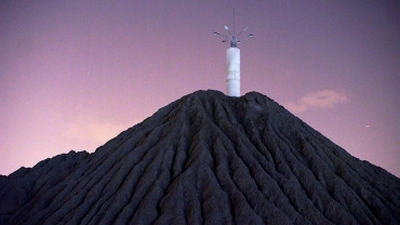 Working in drawing, animation, video, photography, sculpture, installation, and participatory intervention, the artists in the exhibition address the concept of geography and territory in ways as specific as where they are based or as big as China itself, which they see as a concept constantly being questioned and reinvented. These artists freely cross divides to examine the tensions between past and present, myth and fact, reality and dreams, rationality and absurdity, and individuality and collectivity. The artists represented in Tales of Our Time are Chia-En Jao, Kan Xuan, Sun Xun, Sun Yuan & Peng Yu, Tsang Kin-Wah, Yangjiang Group, Zhou Tao. Tales of Our Time is organized by Xiaoyu Weng, The Robert H. N. Ho Family Foundation Associate Curator of Chinese Art, and Hou Hanru, Consulting Curator, The Robert H. N. Ho Family Foundation Chinese Art Initiative. The Robert H. N. Ho Family Foundation Chinese Art Initiative is part of the Guggenheim’s Asian Art Initiative, directed by Alexandra Munroe, Samsung Senior Curator, Asian Art and Senior Advisor, Global Arts. Kyung An, Assistant Curator, Asian Art, provides curatorial support. All commissioned works will enter the Guggenheim’s collection. 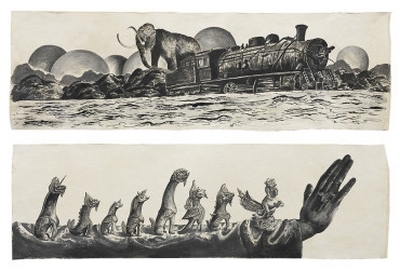 The exhibition’s title refers to the 1936 book Gushi xin bian (Old Tales Retold) by the influential Chinese modernist, social activist, and literary giant Lu Xun. In the book, Lu reinvents Chinese legends, as he considers these tales to be not only a literary genre, but also a strategy for critiquing social conditions and reconstructing history through storytelling. Tales of Our Time is installed on two Tower Levels of the museum. Visitors may enter Tower Level 4 through a passageway lined with fantastic visions inspired by the natural world, drawn in the classical Chinese style on traditional bark paper by Sun Xun (b. 1980). Sun’s installation Mythological Time (2016) centers on his hometown of Fuxin in northeastern China, a coal-mining town that was once the pride of modern-era Chinese industrialization, but which the artist portrays as merely a fleeting scene over many millennia. A second monumental wall-size painting by Sun Xun depicting a surreal prehistoric landscape is also on view. Two video streams are projected onto its surface, sending animated creatures cavorting next to those drawn on paper with ink and acrylics. 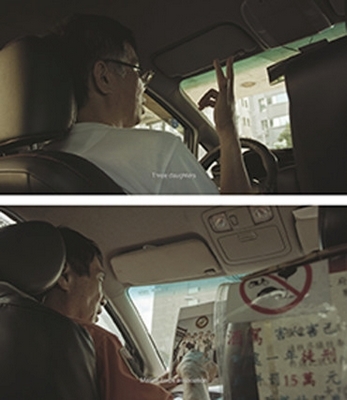 Taxi (2016), a video installation, presents conversations conducted by the artist Chia-En Jao (b. 1976) with taxi drivers in Taipei. The artist asked drivers to take him to historically contested destinations in the city, such as a branch of Chang Hwa Bank where a mass protest was suppressed by Chiang Kai-shek’s military regime in 1947, the Presidential Office Building, the Grand Hotel, or the National Taiwan Museum. Recorded documentary style, the conversations meander through difficult memories of the Japanese occupation and martial law to present-day concerns. The artist has also created a flag for the installation, a traditional coat of arms representing many aspects of Taiwanese society, including its aboriginal communities. Through this investigation into the powerful connection between history and storytelling, Jao creates a mental map of Taipei that honors individual memory and experience. Nearby Taxi on Tower Level 4 is a futuristic, pod-like video installation by Zhou Tao (b. 1976). Land of the Throat (2016) evokes a phenomenon characteristic of China’s urbanization today: the construction of the new and the consequential transformation of the land. Two synchronized videos composed of footage recorded in Guangdong, China and Arizona are projected onto opposite sides of an enclosed structure in the gallery space. A cow chained to an abandoned industrial washing machine moos in an otherwise silent, desolate landscape; workers pour out of construction sites; children play aimlessly; dogs and rats roam near fishing holes; and rescue workers in Shenzhen care for survivors injured in the city’s 2015 landslide. Kan Xuan (b. 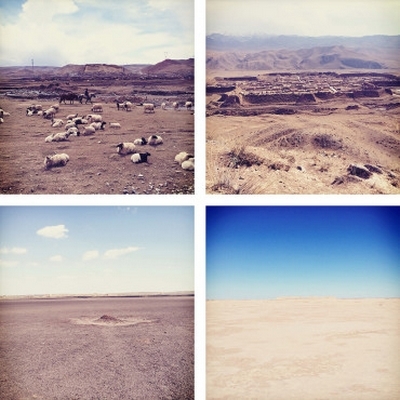 1972) is an artist who splits her time between Beijing and Amsterdam. She traveled for more than five months to far-flung parts of China to photograph and research the remains of 110 ancient cities to create the multi-media installation Ku Lüè Er (2016), on view on Tower Level 4. On one gallery wall, eleven flat-screen monitors rhythmically loop videos of various lengths, each featuring hundreds of the thousands of mobile-phone images Kan took while traveling. The artist manipulated the color of the images and edited them in a stop-motion style. A lone video monitor is stationed on the floor, leaning over a floor projection of simple, notational maps created by the artist from her memories of site locations. The floor monitor sends out smacking, splashing sounds from balls of clay being thrown in a children’s game. A few stone sculptures hang nearby, their knotted forms echoing the fences that guarded these lost cities. Instead of providing historical knowledge or factual statistics, Kan Xuan engages China’s vast history of dynasties and evolution of territories through her intimate personal emotions and experience as a reminder of our collective memory and oblivion. Yangjiang Group, whose founding artists are Zheng Guogu (b. 1970), Chen Zaiyan (b. 1971), and Sun Qinglin (b. 1974), conjure a small utopia in Tales of Our Time. Unwritten Rules Cannot Be Broken (2016) is installed along a Frank Lloyd Wright–designed circular area overlooking Central Park. Here Chinese tea is to be shared on simple plywood furniture set amid calligraphic works and a temporary Chinese garden, which is visible on the outside balcony and contains bamboo, shrubs, a miniature bridge, and a pond. As part of the participatory installation, visitors are encouraged to measure their blood pressure and heart rate before and after they enter this area—a humorous means designed to calculate the purported relaxing effects of a tea gathering in an art exhibition. A green and white calligraphic mural is suspended several stories from the ceiling to the ground floor of the museum’s Thannhauser Gallery. Since 2002 this art collaborative has been inviting neighbors in Yangjiang, its small hometown on the southern coast, to drink tea, play soccer, practice calligraphy, and enjoy communal dinners. In symbolically transporting their small plot of land to New York, the Yangijiang Group has neither left behind its humor nor its desire to create a borderless, anarchist zone of citizenship and belonging. The Tower Level 5 gallery houses Can’t Help Myself (2016), a massive robot with a mechanical arm created by Sun Yuan & Peng Yu (b. 1972 and 1974), two longtime collaborators based in Beijing. 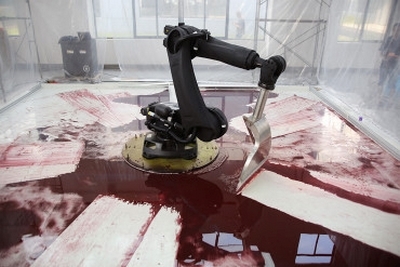 Placed behind clear acrylic walls, the machine is programmed to perform one very specific action: with its modified front arm, it guards a puddle of dark red viscous liquid. As the red substance slowly spreads on the ground, the robot frenetically shovels it back into place, leaving smudges reminiscent of contemporary surveillance warfare. Sun and Peng, who are known for using bold humor with undertones of violence to address provocative topics, neither pose nor answer the question of whether the repetitious dance of the robot in Can’t Help Myself is absurd, authoritarian, or both. In a darkened gallery, also on Tower Level 5, an immersive projection sends images of rocks, ships, oceans, and waves washing over the viewer. Entitled In The End Is The Word (2016), this six-channel video installation by Hong Kong–based artist Tsang Kin-Wah (b. 1976) interweaves found footage, sound, and light. 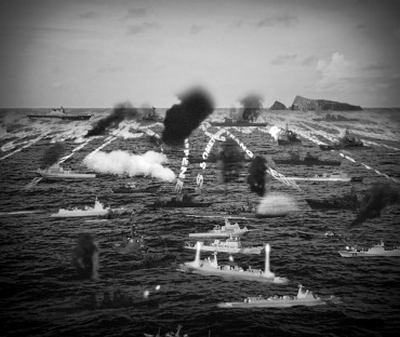 The work begins with a rush of seemingly banal shots of a tsunami at sea near the site of an ongoing territorial dispute between China and Japan, the Diaoyu Islands (known as Senkaku Islands in Japanese). These images then begin to morph into abstractions. Synchronized videos projected onto the walls and floor of the dimly lit room create the illusion that animated, coiling strips of words and phrases are pouring out of the video images and into the gallery. Finally, rather than simply disappear, these images accumulate into a crescendo of blindingly bright light, a state the artist likens to sa?sara, a Sanskrit word meaning “perpetual wandering” in the sea of life’s suffering. In addition to In The End Is The Word, Tsang created No(thing/Fact) Outside (2016), a vinyl text installation that extends beyond the Tower galleries–climbing walls and snaking along floors in less prominent areas in the museum, such as elevators and stairwells. Reflecting Tsang’s ruminations on the exhibition, the work spatially and conceptually links the stories told by the artists in Tales of Our Time. A conceptual extension of the exhibition, the catalogue edited by Xiaoyu Weng and Hou Hanru blends a traditional museum publication with a fiction anthology. Featuring scholarly essays and artwork descriptions, it unconventionally examines the exhibition artists, who all challenge current views about art from China. Interwoven with these essays are seven commissioned short stories by the Chinese and American fiction writers Han Song, Hon Lai-chu, Li Juan, Ken Liu, Lo Yi-chin, Wang Bang, and Brian Kuan Wood. The exhibition and accompanying catalogue offer a heterogeneous view of contemporary art and culture from China, highlighting tensions between individual narratives and mainstream history as well as showing how the gaps between the two can be transcended.